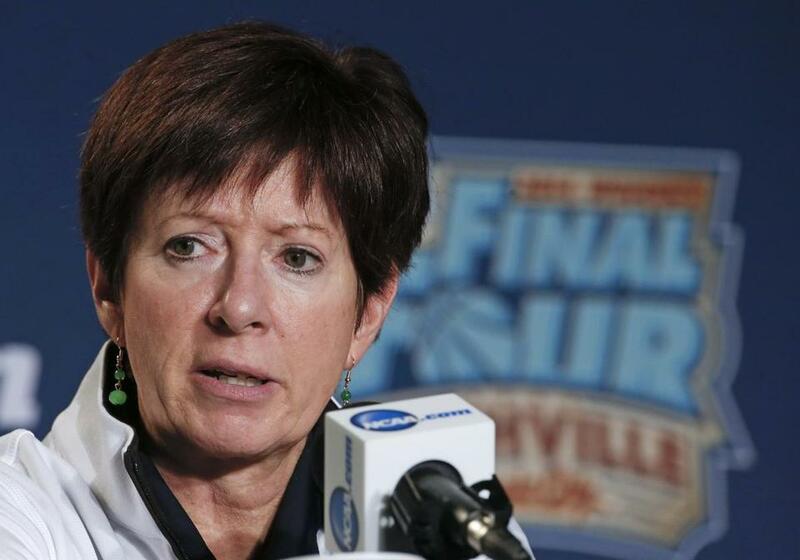 Notre Dame coach Muffet McGraw said there’s tension in her relationship with UConn. NASHVILLE — The tension in the room was palpable. When the University of Connecticut women’s basketball team assembled in a small meeting room in the bowels of Bridgestone Arena along with the Notre Dame women’s squad Saturday for the presentation of the Associated Press’ Player and Coach of the Year awards, it made for a combustible situation. UConn’s Breanna Stewart and Notre Dame’s Kayla McBride, both AP All-Americans, were finalists for Player of the Year. Meanwhile, UConn’s Geno Auriemma and Notre Dame’s Muffet McGraw were in contention for Coach of the Year. An awkward silence filled the small room as both teams assembled in support of their teammate and coach. Hard stares were exchanged during the ceremony when Stewart was named Player of the Year and McGraw was selected as Coach of the Year. That much was evident when Stewart sat at a dais after being named Player of the Year and answered questions while facing a scowling Notre Dame team. The undercurrent of animosity between 39-0 UConn and 37-0 Notre Dame — who will meet Tuesday night in the first women’s NCAA national championship between undefeated teams – seemed to reach a boiling point. “I think there were two teams in the room and they were both supporting their respective player and coach,’’ said Stewart, who helped UConn win last year’s title by avenging a pair of regular-season losses to Notre Dame and a setback in the Big East championship game with an 83-65 victory over the Irish in last year’s semifinals. “This is not about Muhammad Ali taunting Joe Frazier,’’ said Auriemma, whose team dispatched Stanford, 75-56, in the nightcap of Sunday’s national semifinal. “That’s not what this is all about. I think, deep down, that’s not who Muffet is, and that’s not who I am. We’re not going to sit up here and taunt each other, trying to get underneath each other’s skin. Still, it didn’t prevent the coaches from taking jabs at each other. To which Auriemma fired back, “The only thing more amazing than that, than how we’ve committed so few fouls, is how many free throws they’ve shot against us in the last three years; that only one team in America gets to shoot free throws against us. Although UConn joined the American Athletic Conference and Notre Dame bolted for the Atlantic Coast Conference, familiarity as former Big East foes seemingly laid the foundation for the contempt between the Huskies and Fighting Irish, who have faced each other 15 times over the last four seasons, including four times in each of the last three seasons. “I think when you play as often as we have in the short period of time, I think a lot of things happen that wouldn’t happen if we didn’t play that often,’’ said Auriemma, who will attempt to guide the Huskies to their ninth national championship, and fifth after an undefeated season. “Nobody knows what it’s like being us. Nobody knows what we go through every day. What our players go through every time they win an award. Everybody’s [ticked] off. The worst part is that they act [ticked] off because our guy won an award. “It’s ‘All Connecticut, all the time. All Connecticut, all the time, and we’re sick of it,’ ” Auriemma added. While he expressed appreciation for the way McGraw’s team has played this season, calling Notre Dame “far and away the best team I’ve seen this year,’’ it did not necessarily mean Auriemma was looking to break bread with his counterpart any time soon. “You got two really, really good teams [in the national championship] so forget the other stuff,’’ Auriemma insisted. “The other stuff is nonsense. I can sit here and list 10,000 other coaches who don’t interact with each other, whose rivalries are intense. This is a function of women’s college basketball. “Sometimes we act like girls,’’ the UConn coach added. “Like we’re supposed to go to dinner every night and play each other and try to beat each other’s brains in, try to win a national championship, and compete like hell – Muffet and Geno – then we’re supposed to get together and have a bottle of wine?